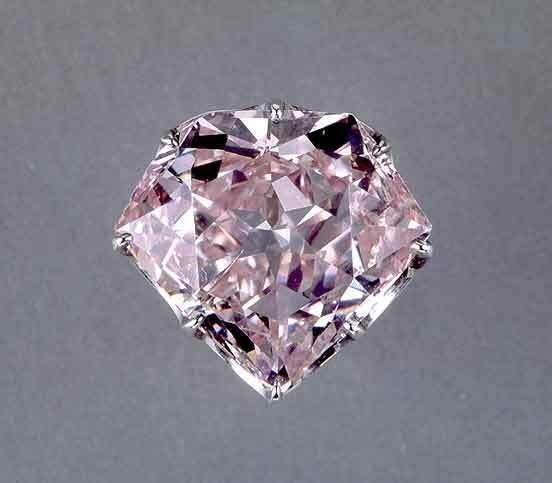 King Louis XIV was respsonsible for the addition of this pale orangey-pink diamond to the Crown Jewels of France. However, the Hortensia was not one of the diamonds which the King had purchased from Jean Baptiste Tavernier, because the largest stone of this particular color which he brought back from India weighed only 14⅞ carats. The Hortensia was the foremost diamond in the third of the nineteen florets of buttonholes listed in the inventory of the Crown Jewels of France, made in 1691. The diamond, which weighs 20 carats (20.53 metric carats) is pale orangey-pink, rather flat and rectangular in shape and is cut on five sides. In the 1791 inventory of the Crown Jewels it was valued at no more than 48,000 livres on account of a crack extending from the edge of the girdle to near the culet. It takes its name from Hortense de Beauharnais, Queen of Holland, undoubtedly because she wore it. Hortense was the daughter of the Empress Josephine, the step-daughter of Napoleon Bonaparte and the mother of Napoleon III. The Hortensia was among the jewels stolen from the Garde Meuble in September of 1792. One year later it was recovered from the attic of an old house in the Halles district of Paris. The Regent Diamond was with it, as were a number of other jewels. As he was about to be executed, a man named Depeyron disclosed that he had hidden it in a bag containing gold and other diamonds, including the forementioned Regent, and where they were hidden. During the First Empire the Hortensia was mounted on the fastening of Napoleon's epaulette braid. Later it was set in the center of the headband of the great diamond-encrusted comb made by the Court Jeweler, Bapst, for Empress Eugénie in 1856. In between, in 1830, the diamond was stolen again, on this occasion from the Ministry of the Marine, but it was quickly recovered. When the French Crown Jewels were sold in 1887, the Hortensia was one of the items excluded, along with the Regent, because of their historic and artistic interest. The Sancy Diamond wouldn't join them in the Louvre until a little less than a century later. "It is a very nice pink colour with a slight orangy tone to it," writes Michael Hing, a jeweler from Great Britain. Michael and I have corresponded a number of times about the major diamonds he has examined. "You could describe it as peach-coloured, but definitely on the pink side of peach. It has good clarity but there's quite a large scratch/crack on the pavilion." This gap is visible in the photo, at the 7-o'clock position under the table. Sources: Famous Diamonds by Ian Balfour and Diamond Cuts in Historic Jewelry 1381 - 1910 by Herbert Tillander. 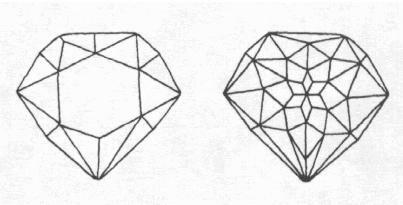 The facet layout of the Hortensia Diamond.